SV40 is an abbreviation for Simian vacuolating virus 40 or Simian virus 40, a polyomavirus that is found in both monkeys and humans. 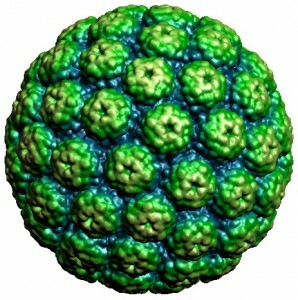 It was named for the effect it produced on infected green monkey cells, which developed an unusual number of vacuoles. Like other polyomaviruses, SV40 is a DNA virus that has the potential to cause tumors in animals, but most often persists as a latent infection. ...An analysis presented at the Vaccine Cell Substrate Conference in 2004 suggested that vaccines used in the former Soviet bloc countries, China, Japan, and Africa, could have been contaminated up to 1980, meaning that hundreds of millions more could have been exposed to the virus unknowingly. Population level studies show no evidence of any increase in cancer incidence as a result of exposure, though SV40 has been extensively studied. A thirty-five year followup found no excess of the cancers putatively associated with SV40..